DVD Okinawan Karate & Kobudo Legends - Meitoku YAGI (Meibukan Goju Ryu), 40 min. *5 New kata *Rare photos *A personal Interview with the Master *Taught the way Miyagi taught him *Precise and accurate movements. 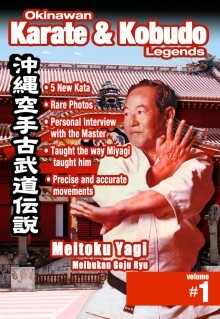 On this DVD you will see Master Meitoku Yagi and be able to learn his personal history and background. Plus you will see and learn the katas of the Meibukan as performed by their top instructors showing every nuance and detail that they are so well known for. Also you will be able to learn and see all the forms that Yagi Sensei developed and added to the Meibukan Goju curriculm. Brilliantly photographed and expertly presented. This preserves the teaching of this great master and his teacher Chojun Miyagi Sensei.